We have an image that we need to crop. Specifically we have a stretchable image but we want to control which cap is visible on the image. 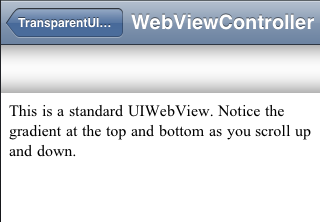 We ran into this when creating custom segmented controls. All we had was a stretchable image with rounded corner caps on both sides and a stretchable 1 pixel in the middle. 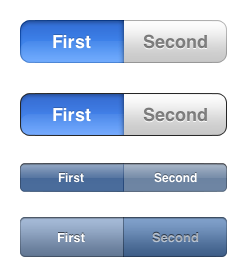 But the buttons for a segmented control have either only the left or right cap showing for the end buttons and for the middle button, neither cap is showing. We will use a graphics context to do the image cropping. If you haven’t used contexts before, Apple’s Quartz 2D Overview has a nice description. To demonstrate, let’s use a stretchable image (‘image’ variable) with 14px caps (‘capWidth’ variable) and let’s generate images 150px wide (‘buttonWidth’ variable). Remember that you can tell stretchable images to draw at any width and they will stretch to accomodate this width. To draw only the left cap, we’ll tell the image to draw at (0,0), but we’ll expand the width enough so the right cap is drawn beyond the bounds of the context. To draw only the right cap, we’ll tell the image to draw at (-14,0), and we’ll also expand the width enough so the left cap is drawn beyond the bounds of the context. To draw no caps, we’ll tell the image to draw at (-14,0), and we’ll also expand the width enough so that both caps are drawn beyond the bounds of the context. 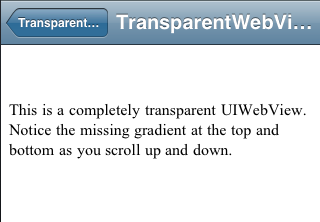 Images for your iOS apps are too big. You’re creating variations of the same image that only differ in width. A great way to reduce the size of images and reuse images is to use stretchable images. Smaller image sizes reduce the app size and users will have to wait less for the app to download from the AppStore. Make resource files as small as possible. Files reside on the disk but must be loaded into memory before they can be used; compress all image files to make them as small as possible. 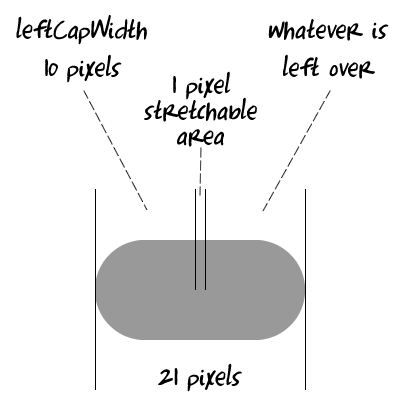 A stretchable image has 3 parts: A left cap, a one pixel stretchable area and a right cap. These images when scaled or resized will draw both caps on either side and repeat the middle pixel. If we create two images then we can set the background image of a button for the normal and highlighted states and get some very nice looking buttons using very small images. To recreate features of existing apps, we can use a big clue: the images an app uses. This will often give us insight into how the feature was built. You can right click on an App in iTunes and see the app’s .ipa file. 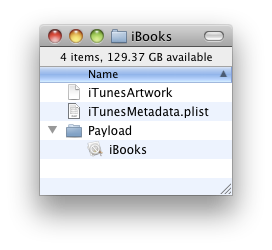 An .ipa file is just a zip file that is easily expanded resulting in a Payload folder that has the actual .app. But we can’t just double click on the images and open them in something like Preview.app. 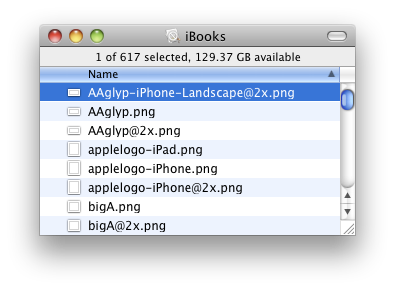 During app compilation Xcode optimizes all images so they aren’t readable by standard tools like Preview.app. We need to undo the optimization and restore the images back to their original form. The tool that the SDK uses to optimize the images is pngcrush and starting with the 3.2 SDK, Apple added the ‘revert-iphone-optimizations’ option to undo this optimization. I wrote a quick ruby script called appcrush that automates this process.